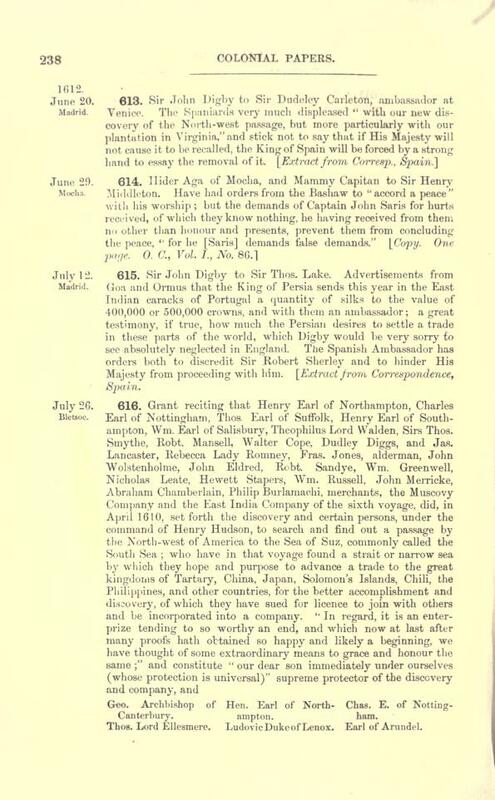 You requested I research Calendar of State Papers, Colonial Series, W. Noel Sainsbury, ed., London: Longman, Green, Longman & Roberts, about a branch of the Colepepers/Culpepers involved with the British East India Company, including Edmund Culpeper of India (b. abt. 1728, relocated to Madras, Tamil Nadu, India abt. 1750, m. Sarah abt. 1755 or Joanna abt. 1757, son Charles, b. abt. 1758. 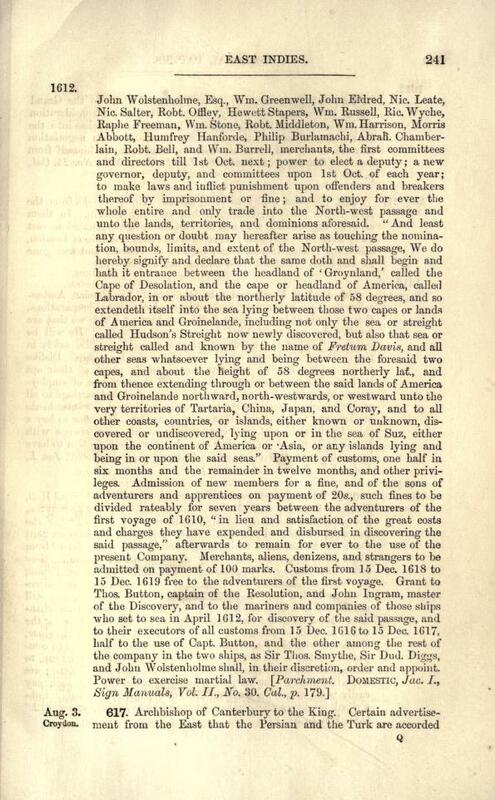 It might appear from the brief excerpt above that the the English had discovered The Northwest Passage, However, a full reading of all four pages makes it clear that this group was organized to fund the discovery of the passage and to secure for its organizers the right to collect customs duties from anyone using the passage. Most likely, Wm. Culpeper was the William Culpeper (1588-1651) who in 1604 inherited his father's estate at Preston Hall. In 1627, he was created a Baronet by Charles I. In our family tree he is referred to as "Sir William Culpeper of Preston Hall in Aylesford, Kent, 1st Baronet"
Sir Thomas Culpeper of Hollingbourne, the Elder, Knight (1575-1662), He purchased Leed's Castle, and was knighted by James I in 1619. "Between the end of the 15th century and the 20th century, colonial powers from Europe dispatched explorers in an attempt to discover a commercial sea route north and west around North America... In 1493, to defuse trade disputes, Pope Alexander VI split the discovered world in two between Spain and Portugal. Thus France, the Netherlands, and England were left without a sea route to Asia, either via Africa or South America, unless their ships defied the ban and explored such waters regardless (they did, and the ban became unenforceable). England called the hypothetical northern route the "Northwest Passage". The desire to establish such a route motivated much of the European exploration of both coasts of North America. When it became apparent that there was no route through the heart of the continent, attention turned to the possibility of a passage through northern waters... In 1906, Roald Amundsen first successfully completed a path from Greenland to Alaska... [Source: Wikipedia contributors, "Northwest Passage," Wikipedia, The Free Encyclopedia, (accessed March 25, 2012)]. 22-24 Nov 1624 (#687) – In "Court Minutes of the East India Company": "Wm. Culpepper having sent over from Danzig for the Company 190 barrells of gunpowder and 25 ‘fatts’ of salpetre; ordered that the Council of War be petitioned for leave to Mr. Evelyn to make the saltpeter into powder for the Company’s use." Source: Vol. 4, 1622-1624, Searchable text. See screenshot: #687. Most likely, this Wm. Culpeper was the same William Culpeper as the one identified above in connection with the 1612 document. 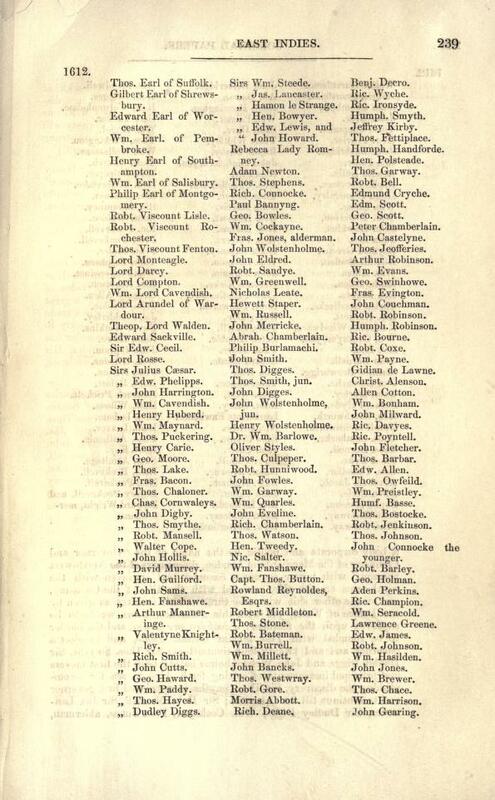 The Calendar of State Papers, Colonial Series, re: the East Indies, ended with the volume ending 1634. 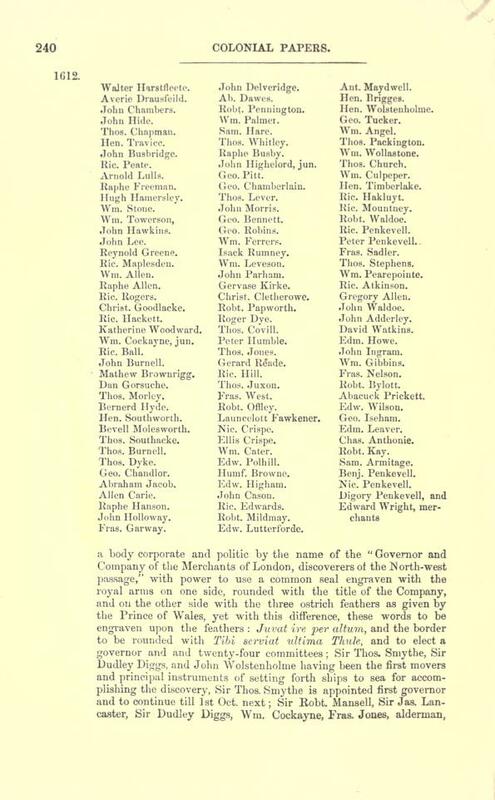 Therefore, I searched briefly for other sources of records about the East India Company for the time period of interest, and I learned that the British Library in London has extensive records. While most of those records appear to be available only for research in London, the website did allow some online searching, and I located a citation about the baptism of an Edmund Culpepper, 13 Feb 1779, in Madras. Ethel Bruce Sainsbury, A Calendar of the Court Minutes Etc. 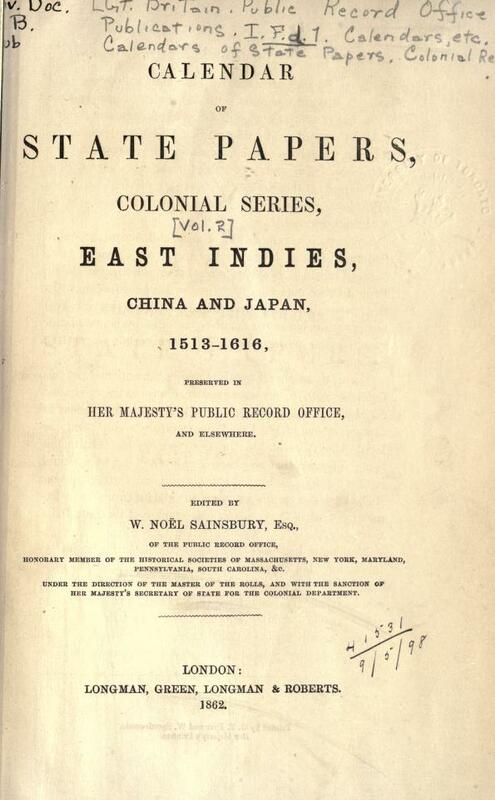 of the East India Company, 1635-1639 (Oxford: Clarendon Press, 1907), available at Internet Archive. No index entries for Culpeper, etc. Calendar of Indian State Papers, Secret Series: Fort William, 1774-75 (Calcutta: Govt. of India, 1864), available at Internet Archive, Not indexed. No Culpeper, etc. entries found through search function.